This morning I used Thameslink between City Thameslink and London Bridge stations. On the three stations on this short route, the doors opened automatically, without passengers having to push any buttons. This is normal London Underground practice and will it be used on the tunnel stations on Crossrail. 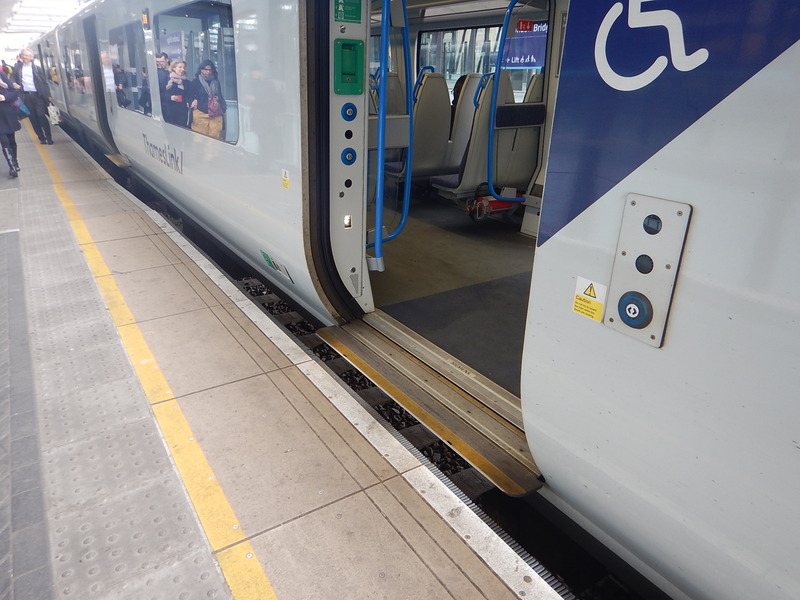 But it struck me, as I got on the train at City Thameslink station, where there is a large gap for passengers to fall into, that automatic opening may well be safer, as passengers don’t have to lean across. The title of this post is the same as that of this article on Ian Visits. 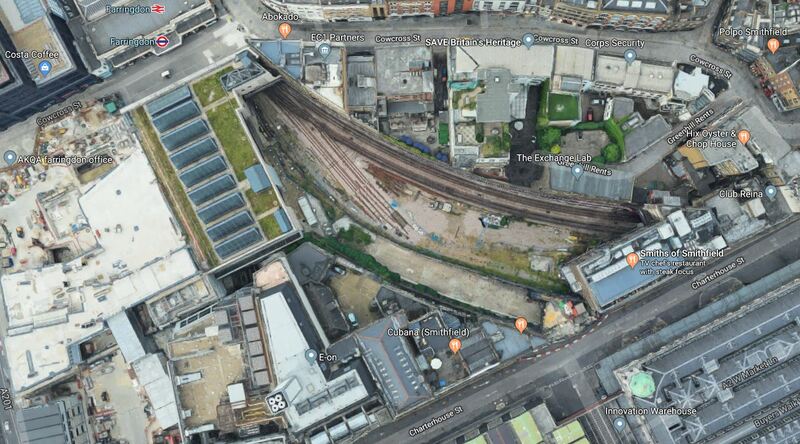 The government has said, that two major housing developments will be built in London beside new railway stations. The development and the funding for Brent Cross Thameslink station is introduced by this paragraph. 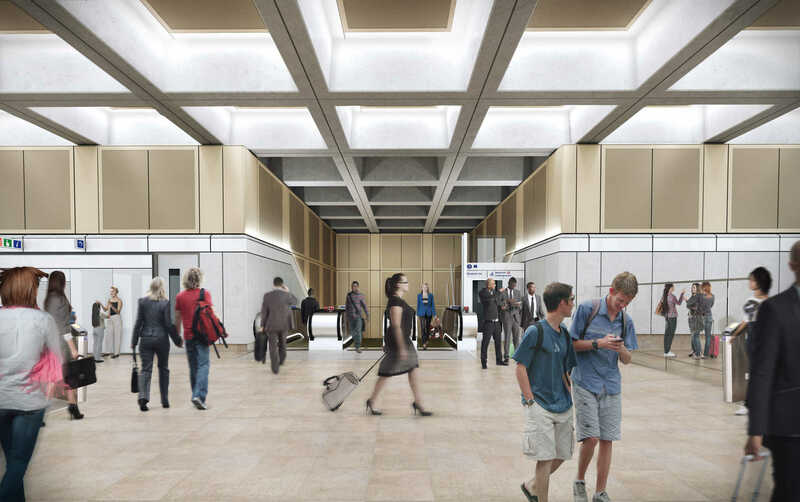 The larger investment will see £320 million being spent on a new Brent Cross West Thameslink station which will lead to a new community of 7,500 properties being built. This is in addition to the £97m grant awarded in the 2016 budget bringing total government investment £416.5 million. Other points about the development include. The development is on the site of the Crickjewood depot. The station could be asn interchange with the West London Orbital Railway. A contractor should be appointed this year, with opeing in 2022. Services could be eight trains per hour (tph) in the Peak and four tph in the Off Peak. A public bridge over the railway will be included. There will be new offices. The Brent Cross Shopping Centre will be extended. The £320 million investment will be repaid from business rates from the commercial development. It all seems to me, that there could be a lot of winners here. The development and the funding for Old Oak Common station is described by this paragraph. 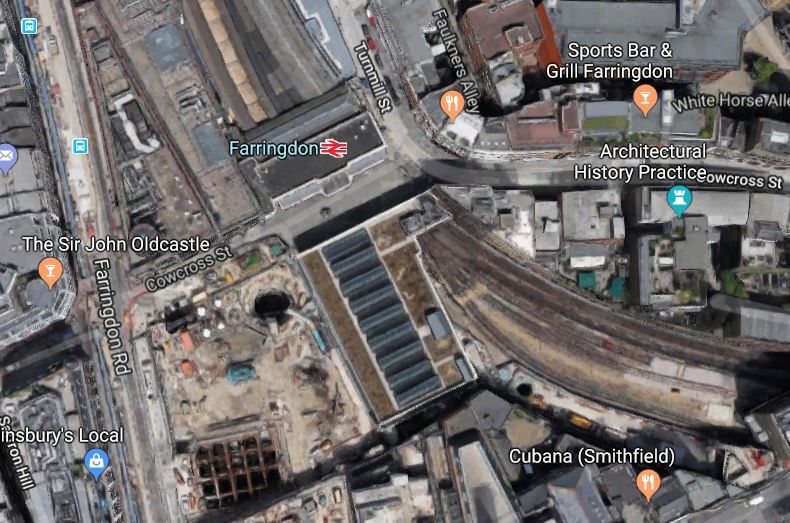 The government will also be providing £250 million so up to 13,000 new homes can be built close to the new HS2 railway station at Old Oak Common. This scheme provides more properties, but it doesn’t as yet include the commercial development. London seems to be building more housing, that at any time in my life. I passed through West Hampstead Thameslink station today and took some pictures of the two tracks that run through the station on the South side of the four tracks of the Midland Main Line. This map from carto.metro.free.fr shows the lines through the various stations at West Hampstead. 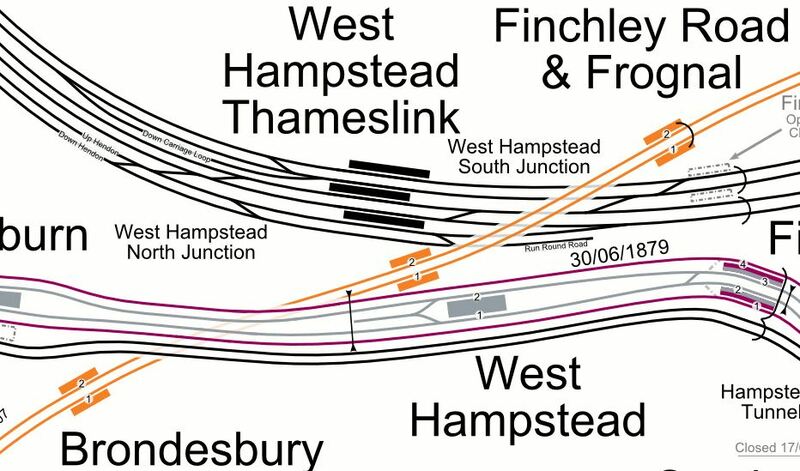 The six tracks shown in black through West Hampstead Thameslink station. The Northernmost four tracks are those of the Midland Main Line. The Southernmost pair are labelled Up Hendon and Down Hendon and lead to the the Dudding Hill Line. via Cricklewood station. There is also a short track which is labelled Run Round Road, which could be useful to reverse trains on the West London Orbital Railway. The six tracks are crossed by the North London Line, which is shown in orange. 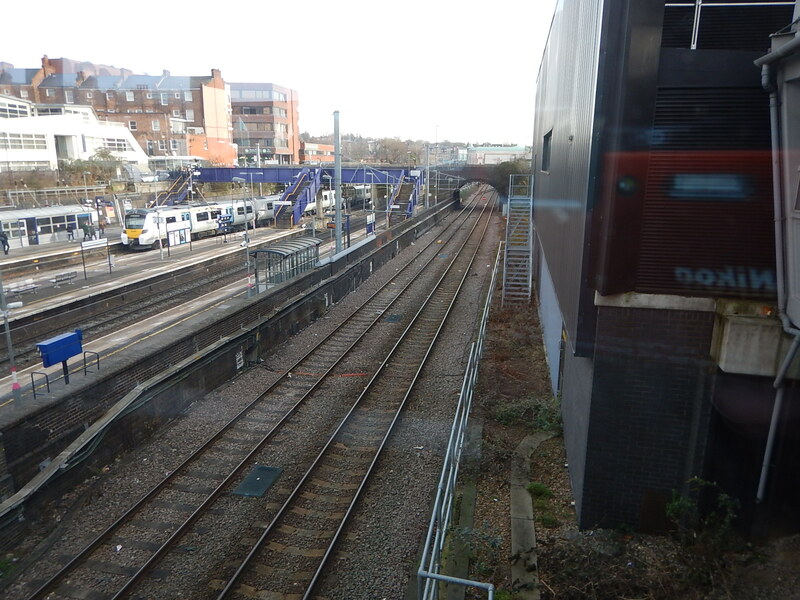 This picture shows the two Hendon Lines looking away from London from the footbridge of the station. The Down Hendon is on the left, with the Up Hendon on the right. Both tracks have 25 KVAC overhead electrification. The bridge, from which I took the picture, is step-free. As there are numerous crossovers on the approach to the station, I feel that it would be possible to build a platform on the Up Hendon line. The platform would share an island and access with the existing Platform 4. It would be fully step-free. Electrification in the platform could recharge an electric train, that was using batteries. 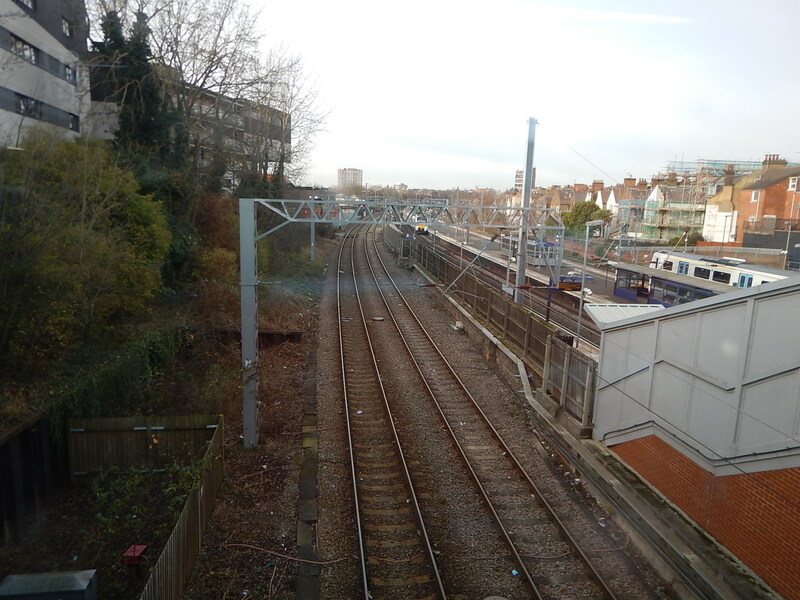 This picture shows the two Hendon Lines looking towards London from the footbridge of the station. 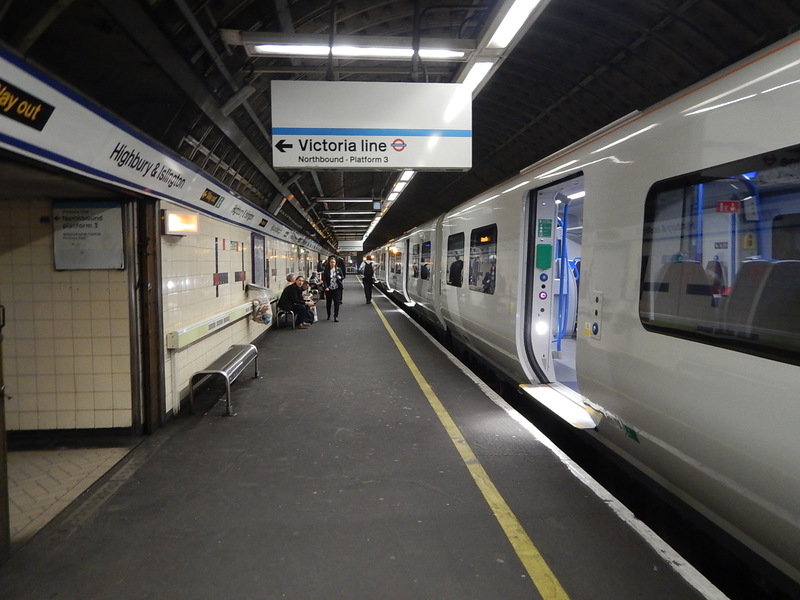 It would appear that if required the platform could be made long enough for an eight-car train or built on the Down Hendon line. 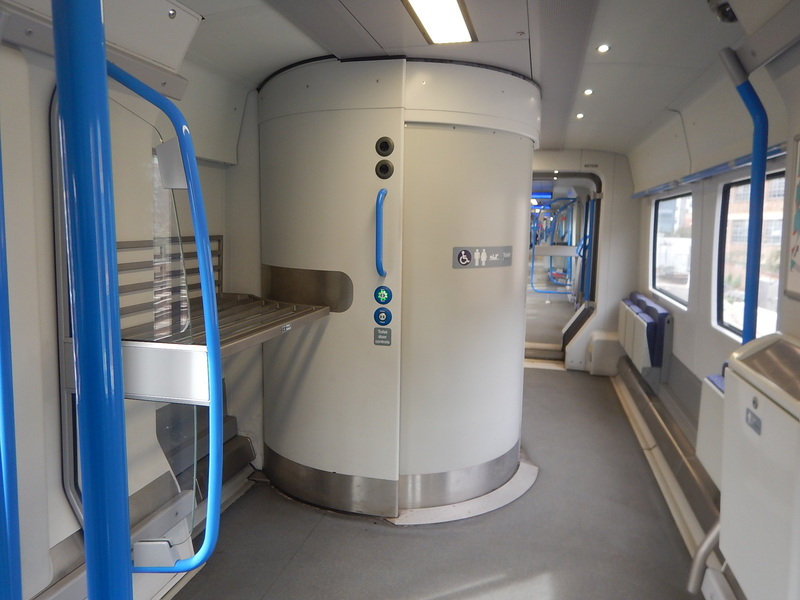 There are certainly possibilities to make the interchange between Thameslink and the West London Orbital Railway a very easy one, that is totally step-free. 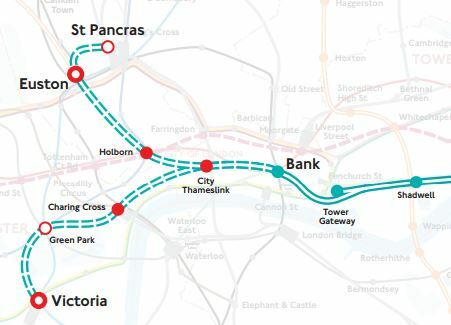 Will The West London Orbital Railway Take Passengers From The North London Line? I suspect that there are passengers, who will swap from the the North London Line to the West London Orbital Railway. They will do it because the new route will be more convenient. This will be no bad thing, as the North London Line can get crowded at times. And it will only get more so in the future! I took these pictures at London Bridge station. The adverts wrapped around the steel security bollards are for Thameslink.